UPDATE: Voters overwhelmingly approved Foster City Measure P by a roughly 80-20 margin, in one of the first major tests of a community's willingness to tax itself to gird against climate change impacts. The only thing between Foster City and the salty San Francisco Bay is an earthen wall, eight miles long, fronted with crushed up concrete and riprap to defend against the sea. On one level, the San Mateo County suburb’s voters face a straightforward choice about this levee on the June 5 ballot: whether to tax themselves to raise it, or run a higher risk of flooding. But amid new reports of sinking land and rising seas, Foster City’s Measure P also offers the Bay Area’s first example for what one bayfront community is willing to do against the threat of climate-induced flooding. 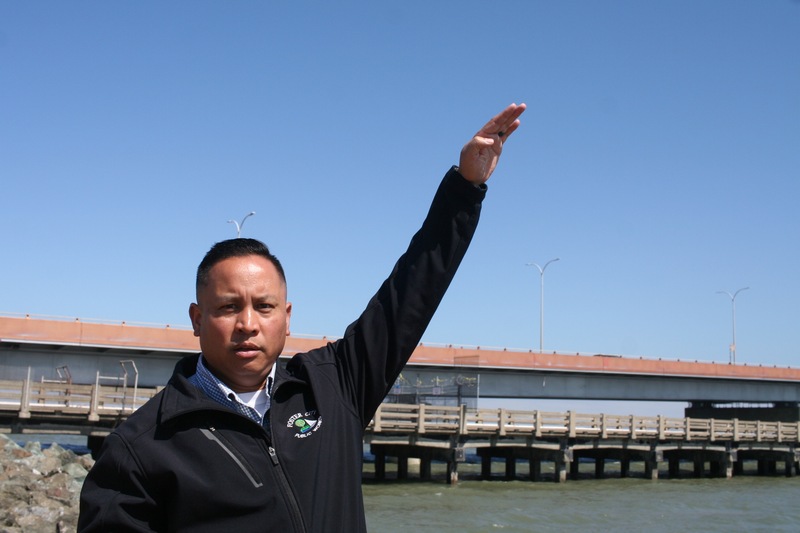 City Manager Jeff Moneda stands atop Foster City’s levee -- it’s 13 feet above sea level -- and looks down across Beach Park Boulevard at homes with a bayfront view, some worth millions of dollars. “They would receive the direct impact first if levees were to be breached,” Moneda says. Behind them, he says all of Foster City is “pretty much” at sea level: once water got in, it would stay on low land. Like other vulnerable places, Foster City has always possessed a mechanical and engineered defense against water; here, a man-made lagoon, connected to the bay, is its central component. When storms are on the way, the public works department lowers the lagoon to ready it for more water, and pumps what’s collected out to the bay. But Moneda says changing conditions would test the system by which the city manages water. 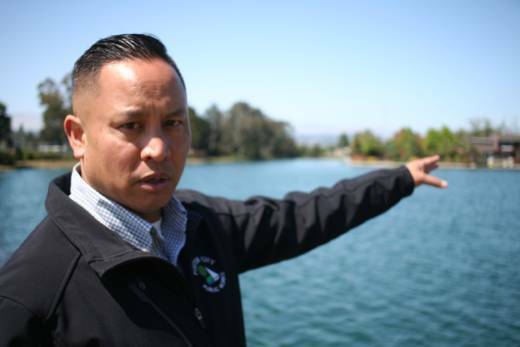 Risk to private property isn’t the only reason city leaders are seeking support for Measure P. Moneda points to Foster City’s water and emergency systems, also right here at sea level: they could flood too. That's a concern for the Federal Emergency Management Agency. The agency has been remapping the region to assess the true risk of flood, in part because of climate change. Four years ago, FEMA notified Foster City leaders that the odds of water surging over this levee in a storm are too high, and this levee is far too low. Unless the city has a solution underway by fall, FEMA intends to declare the area a flood hazard zone. Homeowners with federally-backed mortgages or risk-averse lenders would have to buy flood insurance. Some fear that with a flood hazard disclosure, property values could drop. 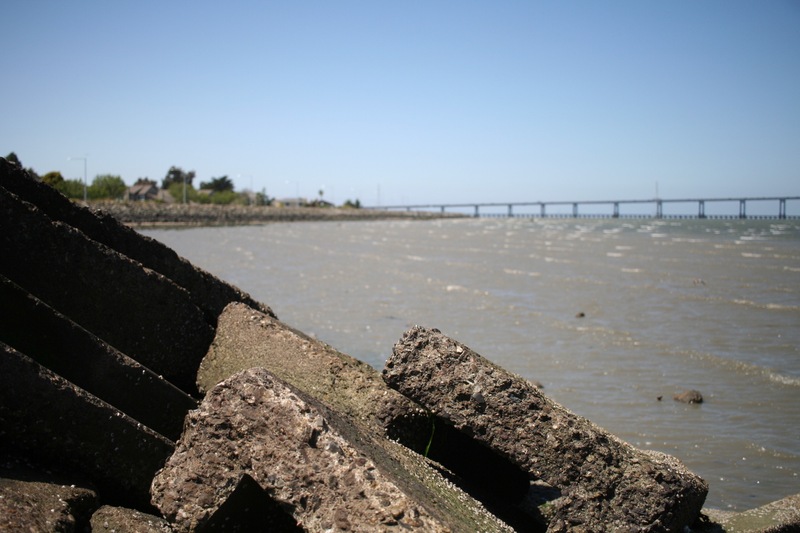 Beyond that, raising the levee to meet FEMA requirements draws the attention of the Bay Conservation Development Commission, which has authority over the first hundred feet inland for all four hundred miles of bay shoreline. The BCDC requires consideration of sea level rise in proposed developments; Foster City did that by hiring consultants, who recommended planning for 2 feet of sea level rise within 32 years. So the city proposes to sink steel reinforcements in bay mud to raise the levee up to 8 feet higher, to meet FEMA’s flood requirements, and BCDC’s development guidance. Measure P would authorize Foster City to purchase $90 million in bonds, and pay for them with a special tax of about $40 per $100,000 in property valuation. If you bought a house there today at the market average, you’d be looking at another $560 a year in taxes. The city contrasts that with the cost of flood insurance inside a special hazard zone; Moneda says officials called local insurance agents and priced that at $3,000 a year or more. “The levee improvement is the only option,” says Moneda. Even one “hardened” piece of shore changes how waves and tides move throughout the bay, says UC Berkeley's Mark Stacey. Seawalls and levees fortified with riprap reflect wave energy back into the bay and keep water from spreading inland. That raises water levels everywhere. As seas rise, Stacey says more walls along one part of the bay could promote more flooding in another. Other cities along the southern edge of San Francisco Bay are watching what happens with Measure P: some, because they share an interest in funding pumps and walls, and others, nervously. Alameda officials and other critics of the proposal also question whether one city should lead policy on climate change, when a regional, national, or even international response may be more effective. They include former city leaders and the son of Foster City’s namesake, T. Jack Foster, Jr., himself one of the original developers. Is This Necessary, or an Overreaction? When the Fosters arrived, this land was Brewer Island, named for the farmer who levied off marshlands around 1900 to create hay for cattle, while nearby, salt dried in flats for the Leslie Salt company. The Fosters bought 3000 acres of land, dried it out, and dumped another 18 million cubic yards of sand and fill on top of it. Now 89, T. Jack Foster, Jr., doesn’t accept the conclusion that sea level rise is happening fast. And he says in development, they planned for some land to sink. He says FEMA’s wrong, and that Foster City is safe. "The aesthetic damage it does, you can put up with a certain amount of that if you get some benefit otherwise," he says, about a higher levee. "But I don't see any benefit at this time." With a home on Foster’s lagoon, longtime resident Bob Cushman also opposes Measure P.
"I think Jack Foster was a genius when he designed [this place]," he says. The lagoon curves behind his home in the Admirals neighborhood: glassy, dyed blue-green. Cushman’s back deck view is man-made, and he loves it. In the 1990s, he and his wife worked hard to get it. Cushman’s got several objections to Measure P. For one thing, he says, Foster City is sitting on tens of millions of dollars, money already in city coffers that could contribute to the cost of higher levees. For another, he points out that the city’s made it through high water before, and he credits the engineered defense offered by the levee, the pumps, and the lagoon for that. And while he does think climate change merits some response by Foster City, he wonders if up to eight feet of additional levee is an overreaction.